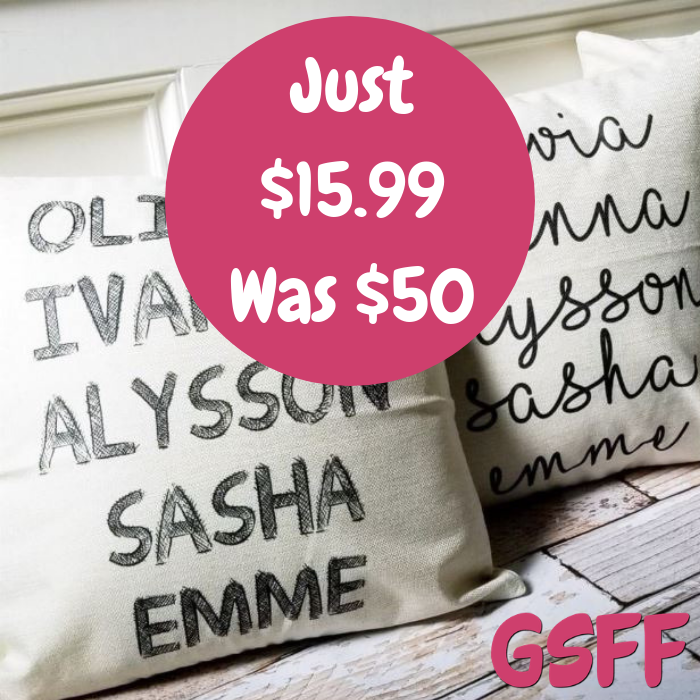 Farmhouse Name Pillow Covers Just $15.99! Down From $50! Shipped! You are here: Home / Great Deals / Black Friday Deals / Farmhouse Name Pillow Covers Just $15.99! Down From $50! Shipped! Until November 24 only! Jane is currently offering these Farmhouse Name Pillow Covers for just $15.99 down from $49.99 PLUS FREE shipping! Check out these fun farmhouse style pillow covers! Each one is made to order. They are designed in-house and then have them printed just for you. They use a vintage shabby typewriter font for up to 6 names. Please note that they will be resizing the fonts to fit on the pillow covers as needed and the names are centered. If you want an ampersand on your cover you will need to add it as a name – they do not put “&” unless you specify it.